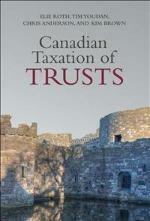 >I>Canadian Taxation of Trusts is an up-to-date and comprehensive statement of the law that governs the taxation of trusts in Canada. It documents and clarifies the unprecedented legislative, judicial, and administrative developments that have occurred in this field in recent years. Relevant legislation, case law, and secondary-source commentary are compiled and presented from a practical legal perspective by authors whose experience in the area is diverse and extensive.